Adam "Roothlus" Levy had a rough day where he won very few pots, at one point celebrating a walk in the big blind because he hadn't had chips pushed to him in so long. He finally moved all in with his short stack with K-Q, only to run into Jonathan Duhamel's pocket aces (A-A). Levy paired his king on the turn for a glimmer of hope, but improved no further, and he was eliminated in 12th place, earning $635,011. Hasan Habib (second from left), who started the day 27th in chips with 27 players remaining, carefully maneuvered his short stack until he was all in with 14 players remaining. Habib moved all in with A-9 suited, but ran into John Racener's A-K suited. 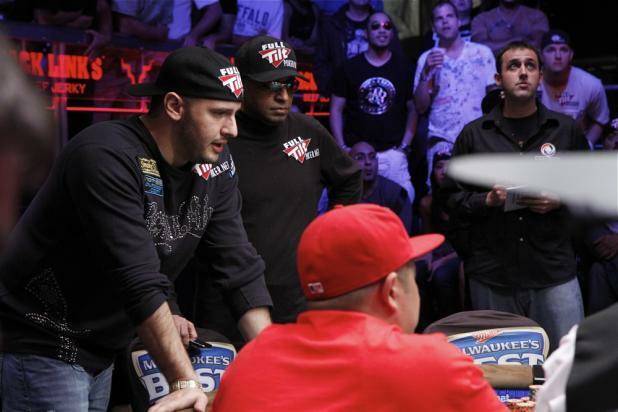 Michael "The Grinder" Mizrachi (left) gave Habib a good-luck fist bump before the flop, and it seemed to have worked -- the flop came 10c-9c-3s to give Habib the lead with a pair of nines. But the turn card paired the board with the 10h, which gave Racener some unexpected outs. When the ace of spades hit the river, it took a moment for some fans to realize that Habib had lost -- the pair of tens on the board counterfeited his pair of nines, and Racener's king kicker played to win the pot. Hasan Habib was eliminated in 14th place, earning $500,165. 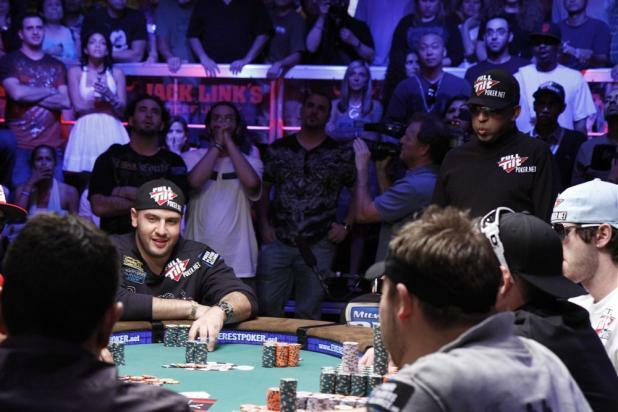 Less than a minute after busting out of the WSOP Main Event on a hand that was poised to make him the chipleader, Matt Affleck was overwhelmed by the moment and covered his face with his hat to hide from the cameras pointed at him from every direction. 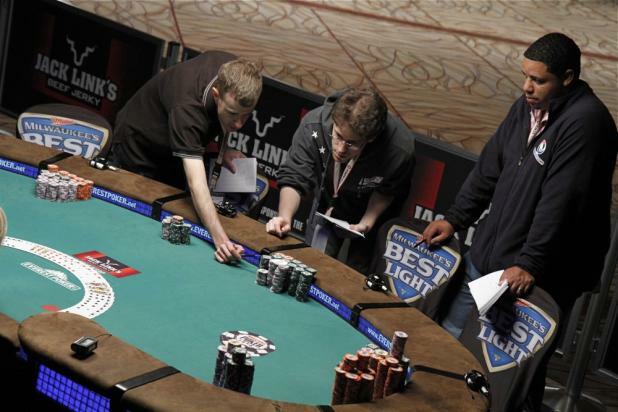 After a deep run last year, where he had a huge stack but ultimately finished in 80th, Matt Affleck (foreground, right) was ready to atone for his mistakes of a year ago and play his way into the November Nine. Well, he did the right things, but got the wrong results. Affleck was betting and raising aggressively to the turn on a board of 10d-9c-7h-Qd, when he moved all in. Jonathan Duhamel tanked for a while before he called with pocket jacks (J-J), which gave him an open-ended straight draw with one card to come. Affleck turned over pocket aces (A-A), and he was more than a 3-to-1 favorite to double up into the chip lead in a position to cruise to the November Nine. But the river card was an 8, filling Duhamel's straight and ending the tournament for Affleck, who fell forward onto the table as if the wind had been knocked out of him. 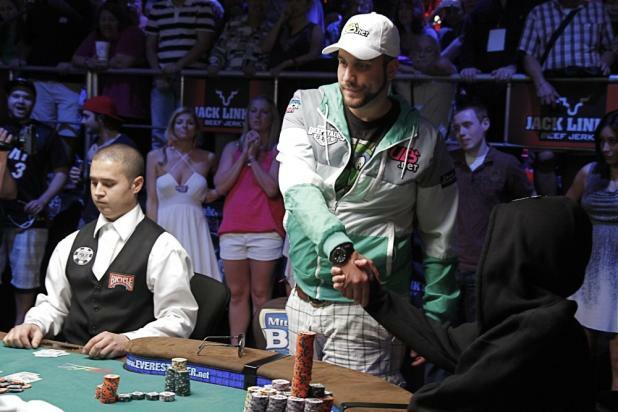 Affleck is such a likable guy that even the other players at the table were rooting for him, and both the dealer and Adam "Roothlus" Levy (center, background) reacted strongly to the bad beat. 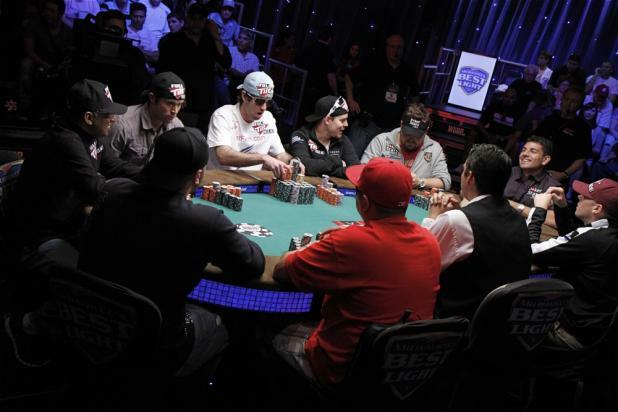 Hasan Habib (standing, right) is short-stacked and all in preflop with pocket kings (K-K) against the A-8 offsuit of Michael Mizrachi' (seated, left). Habib didn't have to worry too long, because he flopped a set of kings to win the hand and double up in chips. 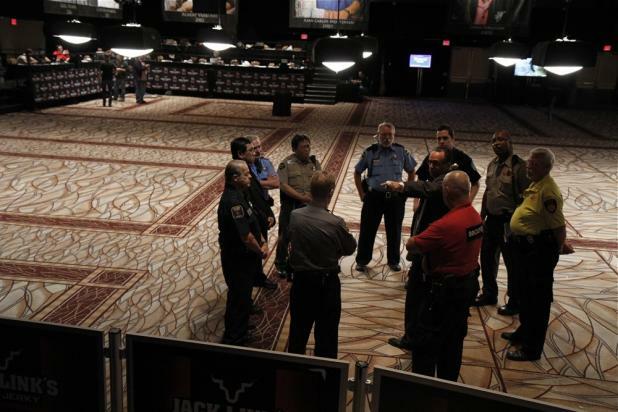 After the chaos of the first table redraw, the WSOP security team meets during dinner to go over some stricter guidelines. 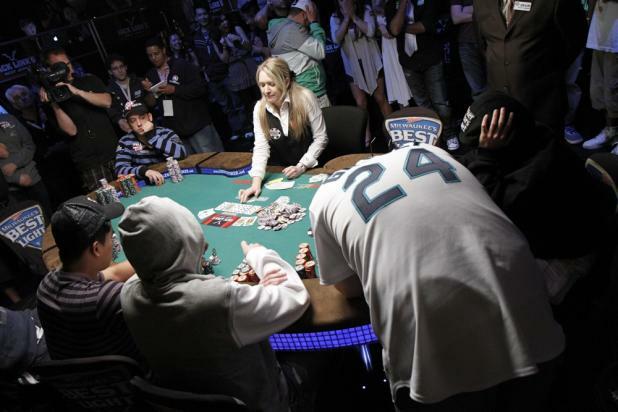 When the WSOP Main Event redraws again (at the final 10 players), all spectators, family, and friends will be cleared from the room so the tournament staff can orderly move the players into their new seats. 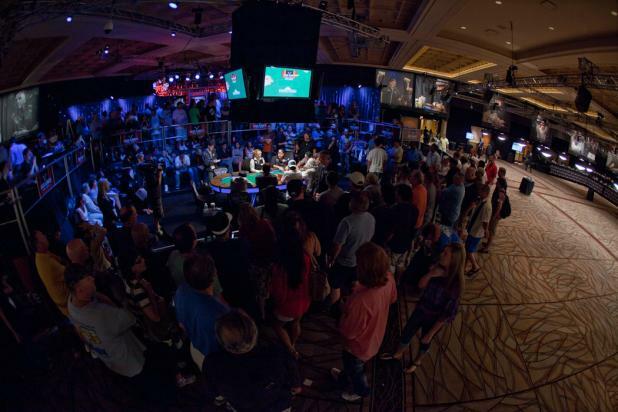 While the Amazon has cleared out during the dinner break on Day 8 of the WSOP Main Event, PokerNews reporters stay behind to get accurate and official chip counts. From left to right: Dave Behr, Mickey Doft, and Matthew Whitefield. 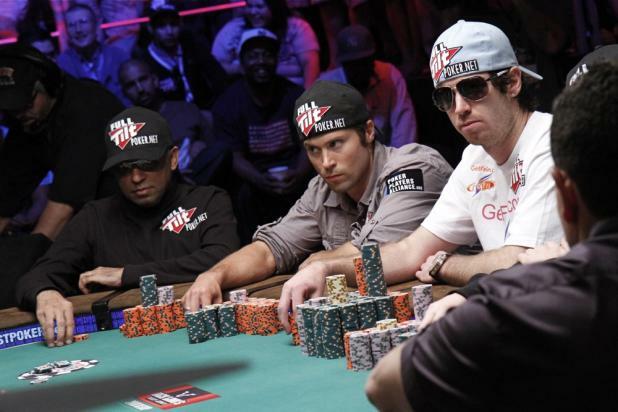 With 18 players remaining in the WSOP Main Event, there are quite a few notable and recognizable pros in the field, including (from left to right) Hasan Habib, Scott Clements, and John Racener. ESPN's featured table is back in action with 18 players remaining, and play will continue tonight until they have reached the November Nine. 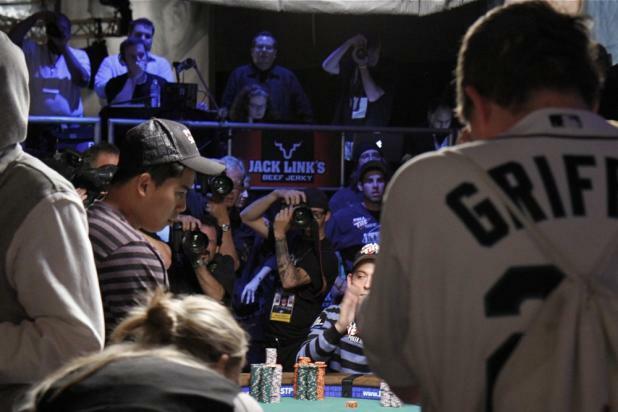 A crowd of poker fans watches the secondary featured table from the rail on Day 8 of the WSOP Main Event.